Michael "Eddie" Edwards (Taron Egerton) has always dreamed of being an Olympic athlete. The only thing is he has never been very athletic. He spent his childhood in leg braces and never took to many sports. He eventually changes his focus to the Winter Olympics and downhill skiing. Though his times were good enough to qualify him, he didn't have the look of an Olympian. However, he has found a way to fulfill his dream by becoming England's first Olympic ski jumper in over 50 years. Now, he just has to learn how to do it in order to compete. 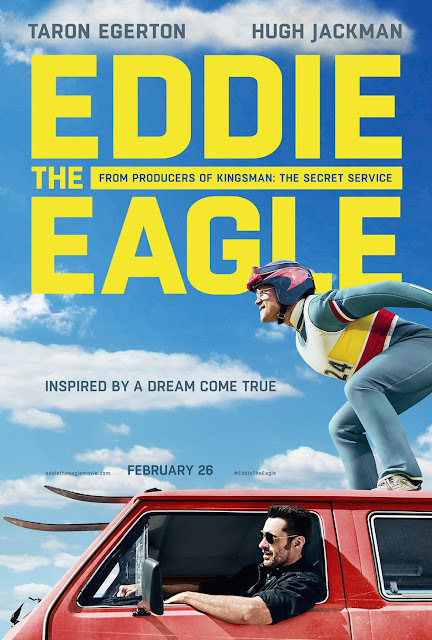 Inspired by true events, Dexter Fletcher's "Eddie the Eagle" tells the story of Michael "Eddie" Edwards, the ski jumper who competed in the 1988 Olympics who captured the hearts of audiences everywhere. Taron Egerton plays the titular Eddie "The Eagle" and he is quite good in the role. We first took notice of him in last years "Kingsman: The Sceret Service" as Eggsy, but his role here as Eddie shows a vastly different character. In fact, he is nearly unrecognizable. Egerton shows he has quite a range and is far more than a simple action star. We have loved him in both of these movies and look forward to seeing him act again. Hugh Jackman plays Bronson Peary, Eddie's American coach. Peary is a disgraced ski jumper and is also an alcoholic. Bronson is a fictional character, though Eddie Edwards did have an American coach as well as a couple others, but this fictionalization doesn't bother us much because the onscreen chemistry between Jackman and Egerton is so good. As a gruff, grizzled, Hugh Jackman type of character, Peary is initially hesitant to help Eddie, fearing he will kill himself trying to learn how to ski jump, but as Eddie pushes Peary and is relentless in his pursuit of him, Peary concedes, and the two form a believable, honest friendship, even when it hurts. Movie goers love feel-good stories that warm the heart. 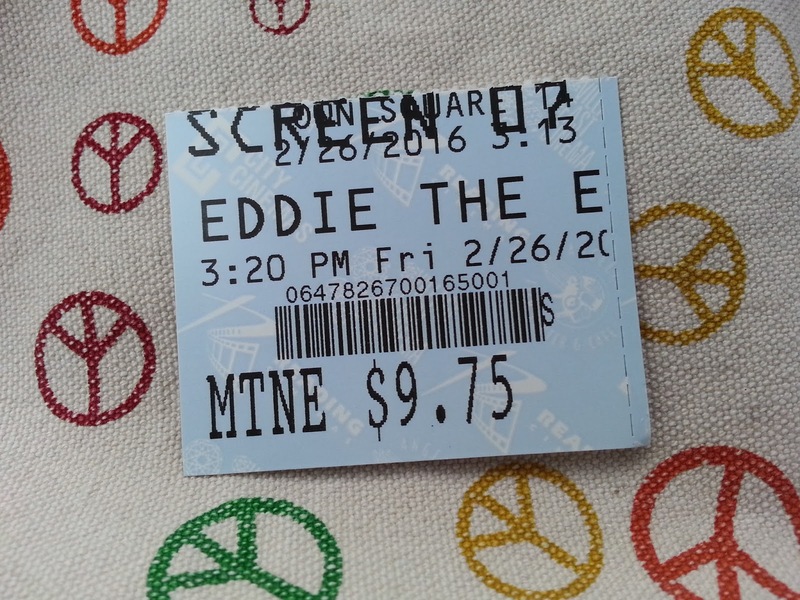 Eddie is the perpetual underdog and a hapless dreamer. He has more heart than talent, and a determination that can not be swayed. We as audience members can't help but root for him, and as a character, he is wholly endearing. Though he eventually became a pretty accomplished downhill skier, Edwards was not allowed to compete for his country in that event because of stodgy higher-ups who claimed he didn't have the look of an Olympian. Determined to go to the Olympics, Eddie decides he will take up the dangerous sports of ski jumping since England has no team in that category. In order to learn how to do it, he heads to Germany. 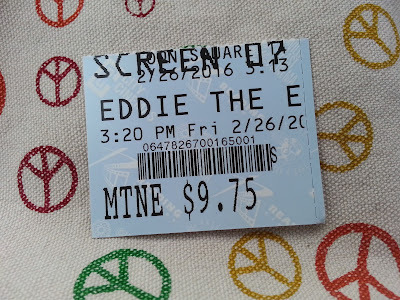 This part of the movie is mostly fictional, but again, we don't mind because the story flows together well, and the events taking place in Germany are the catalyst for Eddie's eventual Olympic endeavors. "Eddie the Eagle" wasn't the only inspirational sports film to come out in February this year. It came out on the heels of "Race," the story of Jesse Owens, and we coincidentally happened to see the two films back-to-back. Where "Race" is the more historically accurate or the two films, it failed to capture the spirit of its time and the man behind the dream. This film, however, truly captures the 80's in every way, shape, and form. It has an wonderful synth-pop score that is so 80's, it made us want to get out of our seats in the theater and do a power dance. When combined with the settings, which usually feature indoor smoking, the costumes, which are poofy, frilly, and very neon, and hairstyles, which are bunched, scrunched, and bulbous, what we wind up watching is a film that did its homework and tried its damnedest to be decade-specific. While "Eddie the Eagle" doesn't exactly reinvent the wheel, doing little to distinguish itself from other inspirational, feel-good sports biopics, at the end of the day, we really don't care. Aren't we at a point now where everything in movies has been done already? Well, this one made us feel good, it made us smile and it made us tear up with joy and heartbreak. It is full of excellent performances and has some great aesthetics, apart from a few video game-esque CGI ski jumping moments. It does what it sets out to do: to make the audience have a good, heartwarming, often times funny and always fun cinematic experience. We definitely recommend this movie! One year ago, we were watching: "The Best Exotic Marigold Hotel"